For me, one of the most fun kinds of movies to watch are the ones in which an indie filmmaker with a little imagination and a passion for making movies scrapes a comparatively miniscule budget together and then goes for broke. One such filmmaker, Mike Conway, put his previous film THE AWAKENING together for less than $6,000, yet I watch it a lot more often than I do the MATRIX sequels. 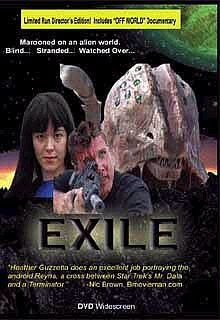 His latest film, another sci-fi actioner entitled EXILE (2008), cost several times that amount yet the budget was still low enough to necessitate considerable ingenuity in lieu of wads of cash. Once again, Mike's very own backyard serves as a backlot, and I'm willing to bet most of those interiors were shot in his garage soundstage. Living in Las Vegas, Nevada means access to some nice desert scenery as usual, but here we also get some great location shots in a desolate area of Utah filled with crags, crevices, and volcanic rock. The story returns to TERRARIUM territory (Mike's second feature, released on DVD by Lionsgate as WAR OF THE PLANETS) with a crashed spaceship on an alien planet inhabited by monsters. This time, cargo ship pilot Jason (Brian Sheridan) and his crew, Karen (Sheila Conway) and Glen (George Miklos), are hijacked by a stowaway (C.J. Hyatt) and forced to land on the planet Midlanteer, which is halfway between their warring planets of Granlibon and Kamoorsta. Jason and crew overpower the enemy soldier but are attacked by Kam fighter ships and crash-land. All three survive the crash but Jason is blinded while Karen and Glen are killed by large crablike creatures with stinger tails. Jason soon makes a startling discovery--a towering female android named Reyna (the 6'4"-in-heels Heather Lei Guzzetta) who has been living in the hidden bunker laboratory of her recently-deceased creator. Reyna, who requires contact with a human in order to survive (something about bio-signatures that I didn't quite catch), adopts the blind Jason as a symbiotic partner and helps him stay alive against the bloodthirsty monsters and Kam soldiers who are after him. As their relationship deepens, the android eventually professes her love for Jason. But when he's captured by a search party during her absence, Jason learns a shocking secret that casts everything he thinks he knows about Reyna into serious doubt. As is the case with all of Mike Conway's homegrown films, you have to keep the limited budget and resources in mind and make allowances whenever EXILE doesn't quite look like a Lucasfilms production. The fun part is seeing how stuff like this was pulled off in the first place. Conway gets a lot of mileage out of his After Effects program with some nifty digital trickery (particularly in the matte shots and gun flashes), and he manages some fairly cool green screen shots as well. Scott Lichfield's hideous planet monsters are nutty and fake-looking, but fun and rather ingeniously done. And as in the case of THE AWAKENING, Airsoft supplies some totally authentic-looking weaponry that adds a lot to the battle scenes. Probably the most impressive visual elements of EXILE are the space scenes by visual effects artist James Rogers. Against a well-rendered background of stars and planets are some cool spaceships that are videogame-quality or better, with fluid movements and some interesting detail during the space battles. The cargo ship's crash landing on the planet (reminiscent of a similar sequence in PITCH BLACK) and subsequent destruction by Kam fighter ships are very well-done for this budget level. As always, one can either be dismissive of the relative simplicity of these effects or admire the fact that they look as good as they do. With the Reyna character, Conway's script blends elements of TERMINATOR, ENEMY MINE, and Data from "Star Trek: The Next Generation" but manages to take things in an unexpected direction before it's over. Heather Lei Guzzetta is an imposing figure as always and is effective in the physical scenes. 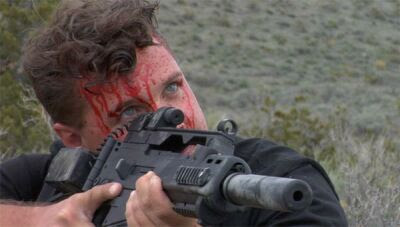 Brian Sheridan, of indie filmmaker Tiffany Sinclair's 2005 film PRAEY, gives a solid performance as Jason, while Sinclair herself is quite good as Jason's girlfriend Sira. Mike Conway's wife Sheila is her usual dependable self, with the performances of the rest of his stock company--including THE AWAKENING vets C.J. Hyatt, George Miklos, and Jake Bass--varying widely in quality. Daughter Carmen Conway does the opening narration. The Utah exteriors look good although direction and photography at times display the somewhat rushed, unpolished quality you'd expect with such a tiny crew and harsh conditions. Fog and smoke effects are overdone in some shots, and the dubbing of the soldiers, whose faces are partially hidden by oxygen masks, is a bit awkward at times. Most of the action scenes are well-done, though, especially when Reyna goes on the offensive against the encroaching soldiers. I also like the ending, which is left intriguingly vague. All of this is accompanied by Mike Conway's own self-performed synthesizer score. The DVD from Midnight Sun Entertainment is in 1.85:1 widescreen with stereo sound. Extras include the 16-minute "making of" featurette "Off World", a trailer, and a very brief short film entitled "Big Dreams." As with the rest of Mike Conway's filmography, EXILE is one of those films that some will find entertaining while others can only shake their heads at how little it resembles the slick megabudget stuff they're accustomed to. As for me, I admire the audacity and tenacity of such do-it-yourself auteurs and enjoy seeing how much they can accomplish with so little to work with. It's sort of like a conjuring trick, making feature films out of thin air, and as always I look forward to seeing what Mike Conway will pull out of his hat next.